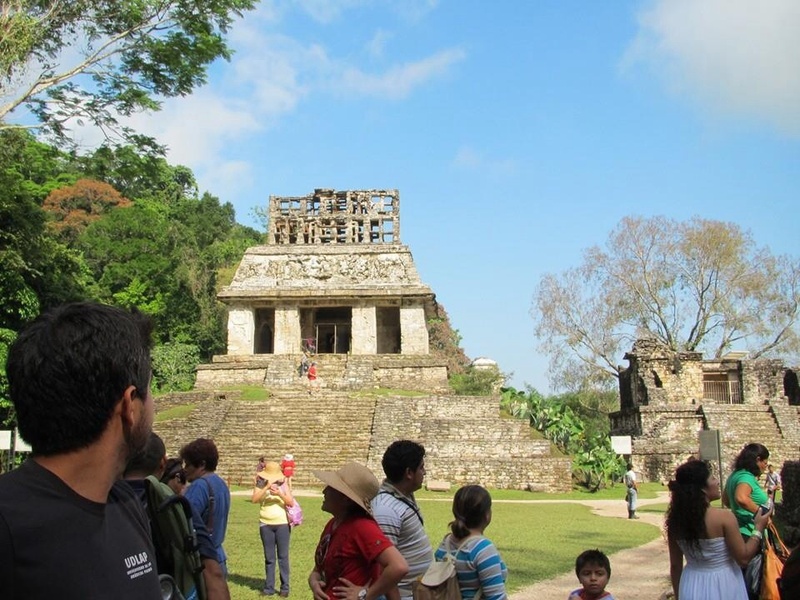 From the sandy coasts of Oaxaca we travelled East and inland to the highlands of Chiapas, famed for its dense jungle, vast array of natural water features, indigenous groups, ancient Maya ruins, and traditional Mexican textile crafts. Mexico is, after all, officially the United Mexican States (comprised of thirty-one), so it should come as no surprise that visiting Chiapas after Oaxaca was an entirely different kettle of fish. 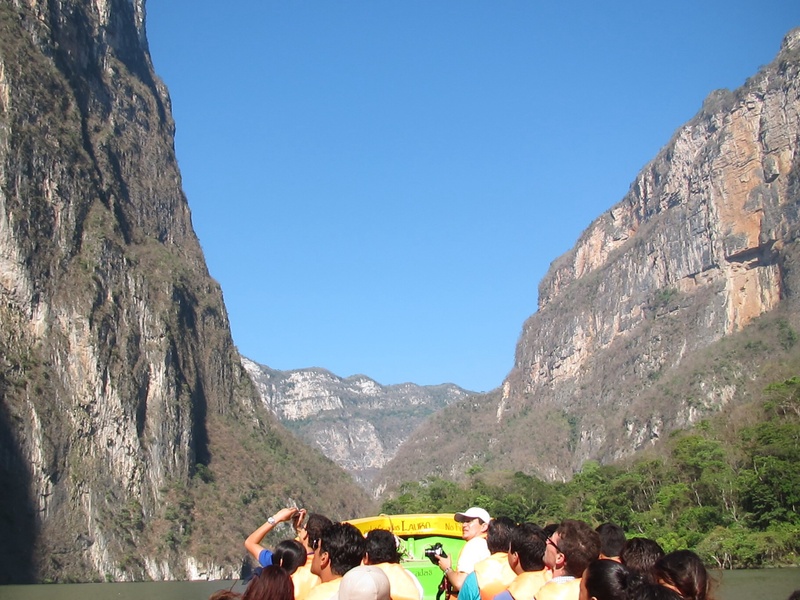 Our first drop-off was at the Cañón del Sumidero, a huge and impressive canyon – complete with wild crocodiles – that we explored by boat. Then we travelled on to the city of San Cristobál de las Casas, where we visited the Jade Museum, the Museo de Kakaw (Chocolate Museum), and squeezed in a spot of shopping at the Mercado de Dulces y Artesanías: a market crammed with stalls and stands selling traditional sweets and hand-crafted products – everything from bags and clothes to jewellery and cushion covers. I absolutely loved the colourful embroidery and really wished I could have come home with my arms and suitcase loaded with delightful wares. 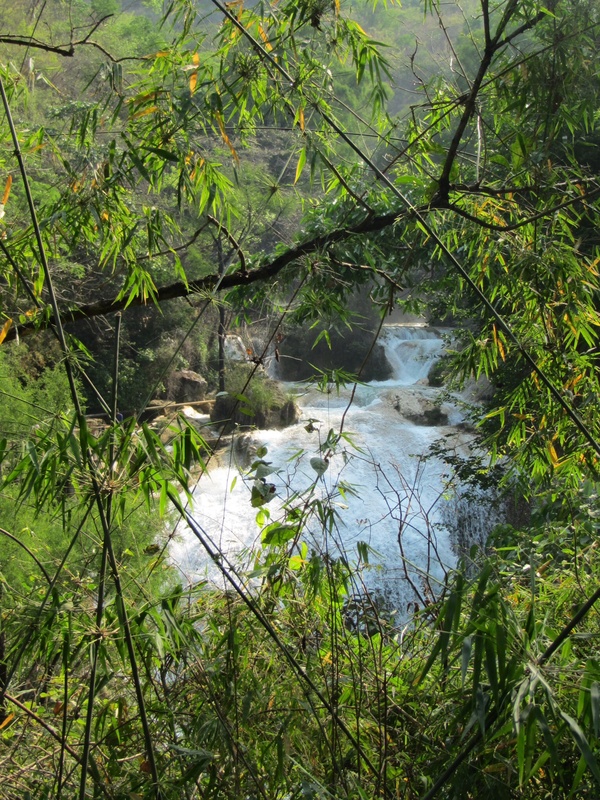 The next day we were off to Cascadas ‘El Chiflón’, a public park home to a series of incredible waterfalls. It was a steep climb to get the best view, but that and the soaking that we got from the viewpoint (as well as the mud-stained shorts sustained from a tumble…) were well worth it! The water was the most beautiful Maya blue, perfectly framed by a glistening rainbow. Next up, Lagunas de Montebello National Park, which is comprised of 59 lakes in a pine forest, famous for their differing shades of blue due to the varying mineral contents. 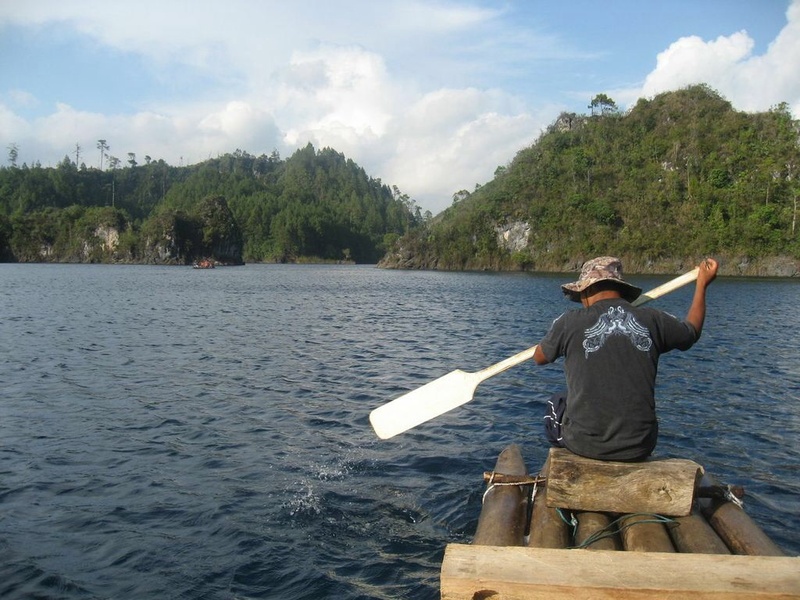 We paddled around one of the lakes in a traditional Mexican balsa wood raft, passing the hour mostly by threatening to push each other off. We then spent the evening in the pretty Pueblo Mágico (Magic Town) of Comitán, where I enjoyed my first glass of wine in three months, a delicious Chilean Sauvignon Blanc! 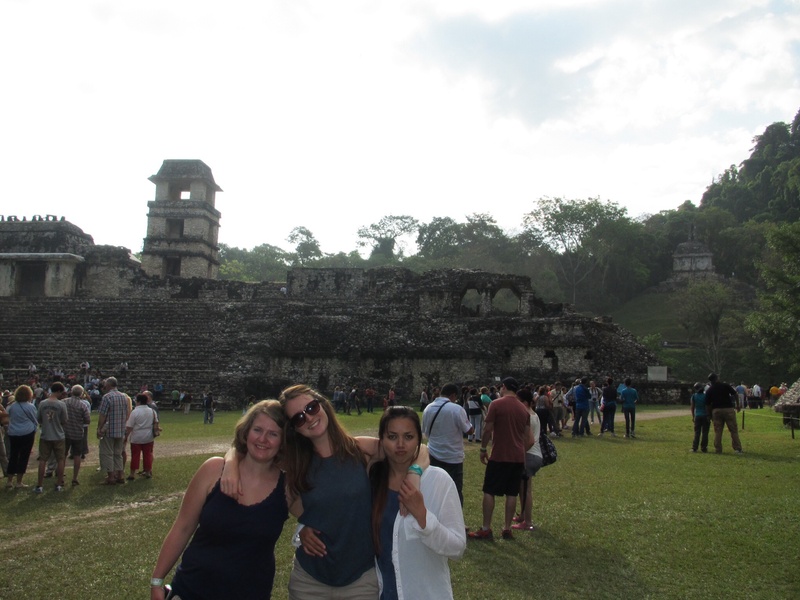 At the crack of dawn the following day we went to Yaxchilán to get our Indiana Jones on. 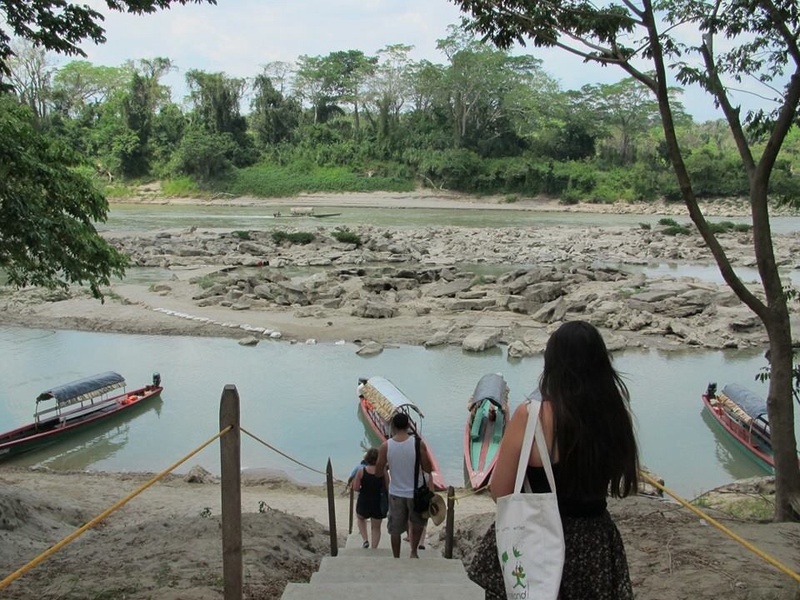 Taking our 459th boat trip of the week, we whizzed half an hour down the half-Mexican, half-Guatemalan Usumacinta River to find the abandoned ancient Maya city deep in the Chiapan jungle. 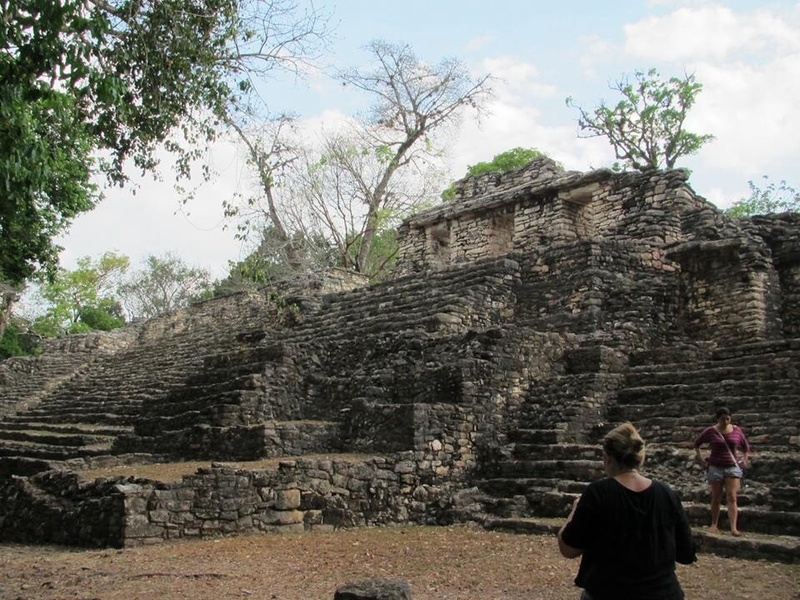 The area had been a powerful Maya state and home to a number of rulers with entertaining names like Moon Skull and Bird Jaguar from 359-808 AD. 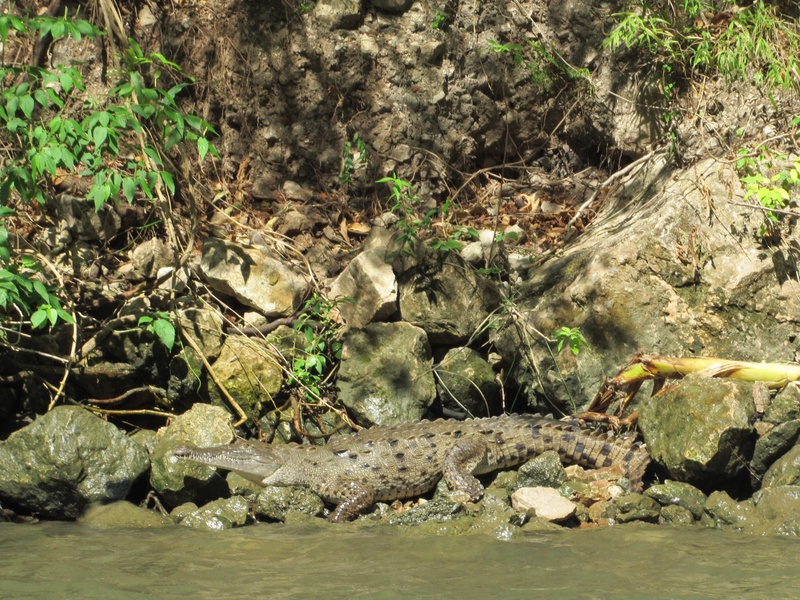 Nowadays its only residents are of the non-human variety, including bats hiding out in the ruins, spiders adorning the walls, giant lizards (not a technical name!) 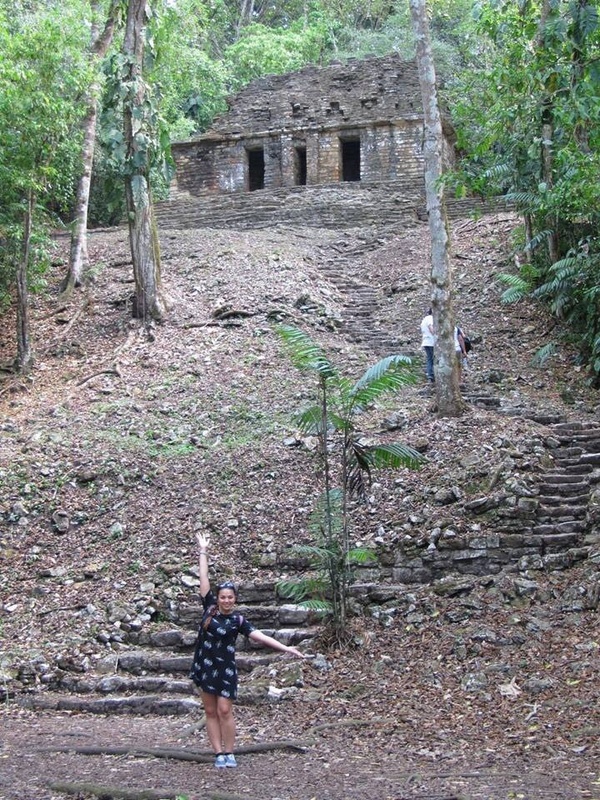 scuttling about in the undergrowth, and Howler monkeys ferociously guarding the buildings: exploring the ancient buildings was like a real life London Dungeon experience, just replacing the human actors with wild creatures. When we arrived I thought they were playing out ‘jungle’ sounds to make the experience more atmospheric, something akin to a Jurassic Park ride in a theme park….not very considerate to the native wildlife, I thought. No no, the sounds were all real. 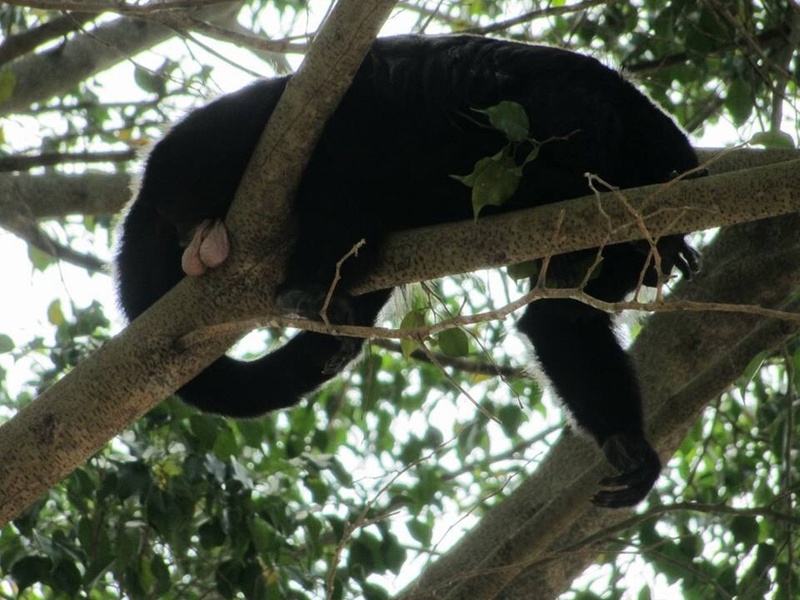 The (appropriately named) monkeys HOWL like you would not believe, which was actually quite intimidating, especially when we later zoomed in on Juli’s photos to see one monkey happily dangling his testicles over the branch! Ruins in surprisingly good nick. 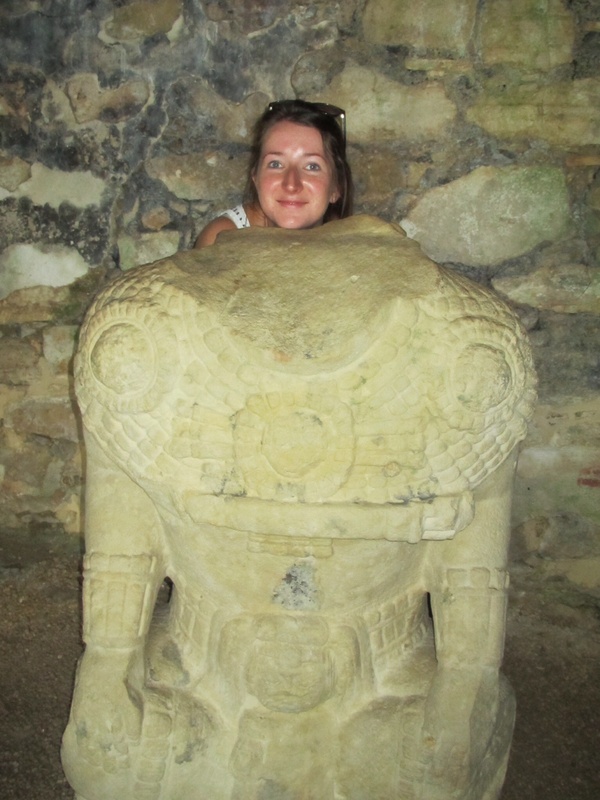 Got told off for this pic…DO NOT MOCK THE GODS. 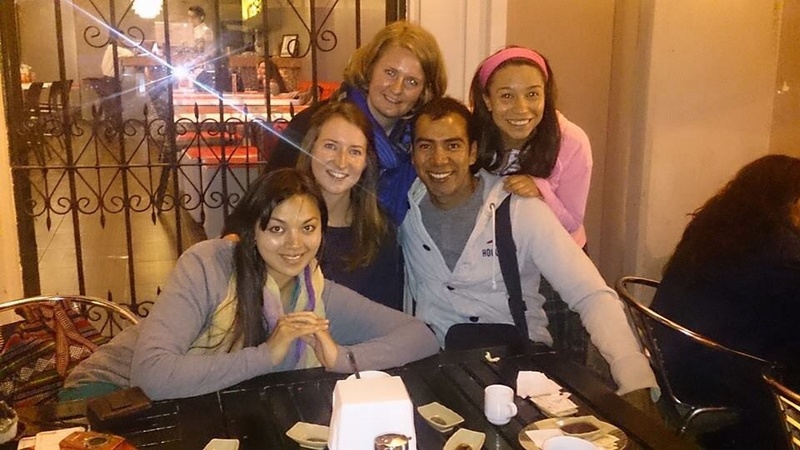 Oh hey Guatemala! 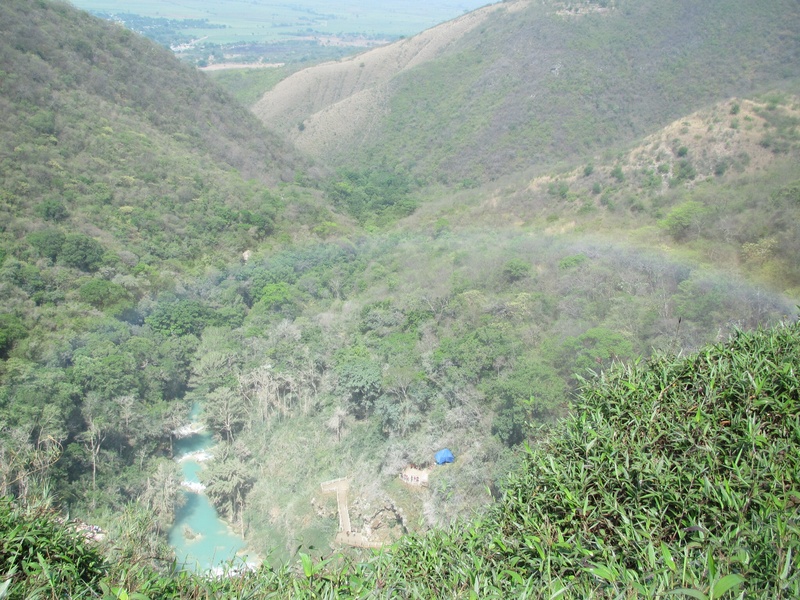 Usumacinta River. We spent that night in Palenque, where there were lizards on the hotel ceiling and enormous cockroaches patrolling the corridors. It rained like someone just tipped out the clouds. Unlike heavy rain in the UK, it didn’t ‘clear the air’ but remained ridiculously hot and humid. A simple explanation: we were in the middle of the jungle. 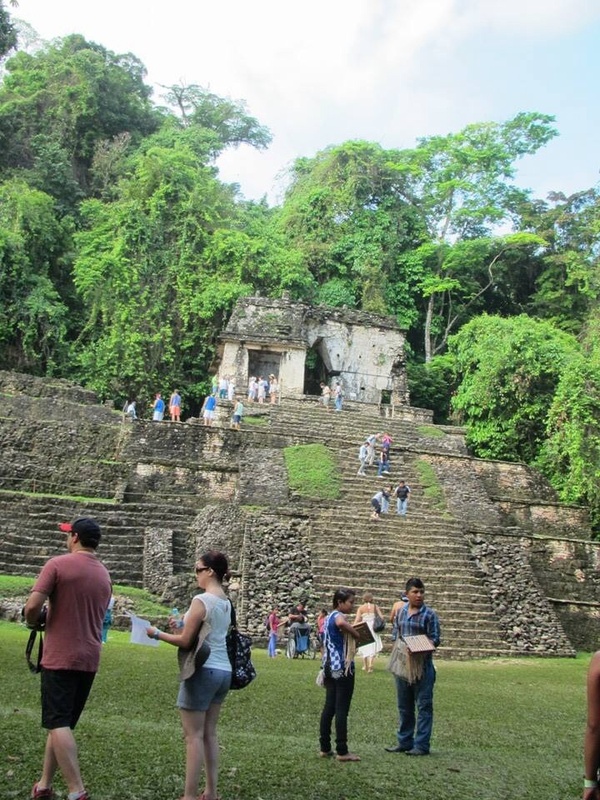 The following morning we went the Maya site of Palenque, which is known as one of the most outstanding sites of the Classic Maya period because of its exceptionally well preserved architectural remains. 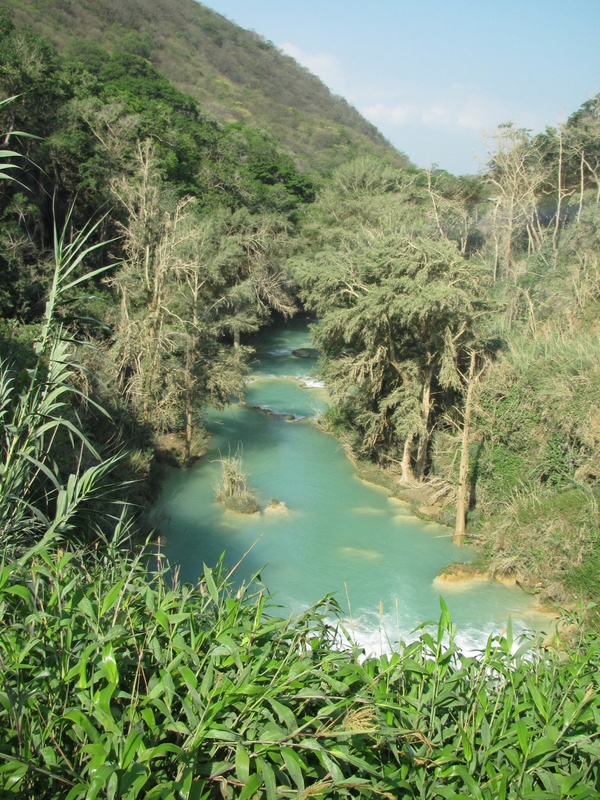 In the afternoon, we went to Agua Azul, an area of stunning ‘blue’ waterfalls. Unfortunately, due to the previous night’s rainfall it was pure Agua Chocolate, so we gave the swimming a miss and passed a couple of hours trying to soothe our monstrous hangovers with copious amounts of fresh coconut instead. We were also lamenting the end of an incredible holiday, with only a fourteen hour minibus ride home left to look forward to. I must take this opportunity to give special thanks to my dear friend Juli for letting me share her camera and pics after my camera failed me on the second day, and more importantly for being such a wonderful friend since I arrived in Mexico and especially throughout our trip. Not only did her companionship mean that I never had to share a bed with a stranger, but having somebody to experience all of Mexico’s oddities and wonders from a similar perspective makes every eventuality here immeasurably more enjoyable. In all honestly, we are largely as clueless as each other, with the exceptions being my offering of the occasional useless fact (does anybody really care that Oaxaca is Mexico’s fifth largest state?) and her acting as my nurse-at-hand. 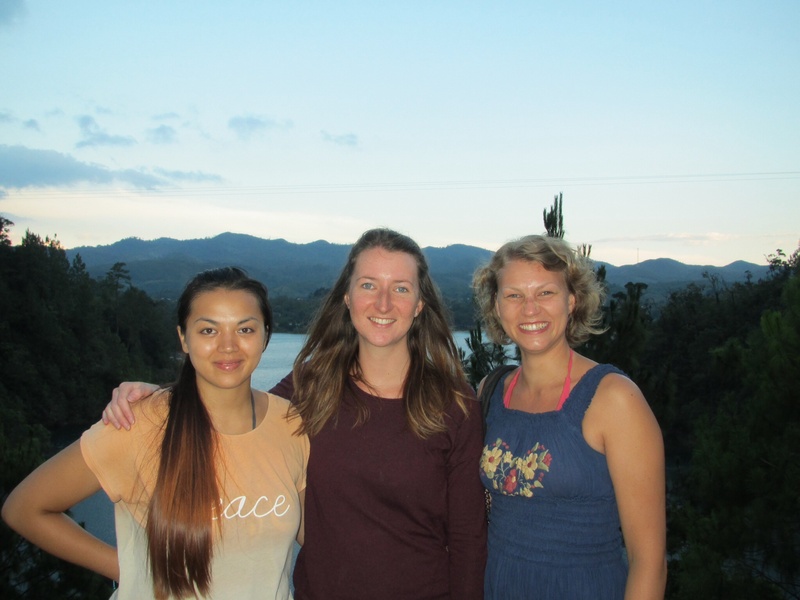 We were labelled by one particularly polite Mexican on our travels as ‘super quiet’ and ‘super annoying’, I’ll leave it to you to guess who was who!